Fun for all ages, this is the first 4-wheel inline caster board available. It combines the movements of snowboarding, surfing and skateboarding into one unique experience. Two decks, connected by a flexible middle component, revolve around horizontal and vertical axes, and make the Shred Sled smoother and easier for both kids and adults to use. Instead of pushing off the board like a regular skateboard, riders use their hips, legs and arms to move the board, similar to movements used to propel surfboards and snowboards. For better control, each deck has a grip surface to maximize traction and stability while the concave decks make for better foot control. Available in your choice of three colors: black, blue or red, the Shred Sled retails for $119.99 is on sale for $89.95! I’m still working on mastering my Shred Sled, but a review will be up soon! * Riders should always wear a helmet and safety gear when using The Shred Sled. Whether the man in your life likes hiking, running or fishing, a Casio Pathfinder watch is one tool he shouldn’t be without. The PAG40-7 is a good choice (and it’s 50% off right now!). Like all Pathfinder watches, it features a compass, altimeter, barometer, and a thermometer, and is water resistant. The digital compass will help him find his position and plan his route, while the barometer/thermometer can help him predict what kind of weather lies ahead. The altimeter tracks altitude, cumulative ascent and decent in route to his destination. With a easy one-touch operation, and an approximate battery life of 18 months, this is a watch that any guy would appreciate. Retails for $200, but find it on Amazon for $99! Though I’m not great at solving a Rubik’s cube, I played with this for a while and found it to be fun. 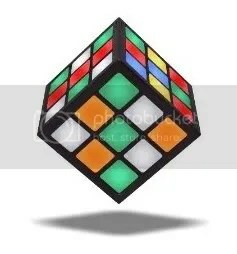 It’s the first completely electronic, solvable Rubik’s Cube and uses technology similar to that found in an iPod touch. All six sides utilize touch sensor technology; slide the lights with a simple swipe of your finger to mimic the moves of the original Cube. A motion-detecting accelerometer only recognizes moves made on the top side of the Cube, so that a player’s fingers won’t move the lights on other sides when holding it. Internal memory allows players to save their current puzzle so they can resume play anytime, and if you’re ever stuck, it can give you a hint or solve itself step by step right before your very eyes. It’s also pretty to look at – the colors pulsate, fade, and change while the TouchCube recharges in its stand. Oh, and did I mention it has sound? Choose from modern or classic sound effects at varying volume levels. Retails for $149.99. Click here to buy it online. I’m all for useful gifts, and this is one of those! The KL-60 helps you stay organized in the midst of the holiday hustle and bustle. Casio has made it simpler than ever to label items for your business and personal use. Now you can easily organize your photos, books, files, movies, toys, clothes and holiday décor. The easy to use QWERTY keyboard makes creating labels simple and fast. The KL-60 includes a 4-digit, 1 line, LCD display with one built-in font and 6 character sizes. With a resolution of 160 DPI, it can print in three sizes (12mm, 9mm, 6mm). Retails for $19.99 and can be found in store at Staples, Office Depot and Office Max. I reviewed another Baby-G watch a few months back, but saw this sweet version and thought it would make a great gift! The Heart Style Baby-G is decorated with rhinestones and a heart design, which adds a graceful, feminine touch. Shock resistant and water resistant to 100M, it’s outfitted with an analog and convenient digital dial for the best of both worlds. Two LED displays provide world time, countdown timer, five daily alarms, 24-hour time, and stopwatch features. Available in lustrous pink and white or a more subtle grey, it’s something casual and tough enough for everyday use. Retails for $99.99. On sale for $65! If you’re looking to buy your wife/girlfriend/mom/grandma a really unique, amazing gift, think about getting them a new washer and dryer. It’s a gift that will keep giving back all year long (and hopefully for many years thereafter!) It’s remarkable how a new appliance gives me such a sense of pride. Thanks to Frigidaire, my laundry room is no longer just a utility room. It’s a part of my home! Read about my experiences with my washer and dryer. Starting at $749 and up. The Keurig B40 Elite Brewer is the ideal brewing system for entertaining! It brews a fresh cup of gourmet coffee or tea in around 30 seconds, using Keurig’s patented K-Cups, which offer over 70 varieties of pre-measured gourmet coffee and tea from a variety of premium brands. The brewers patented one-touch technology ensures precise control of brewing, and there is no messy grinding or clean up. Simply open the lid, insert a K-Cup, close the lid, and select a cup size. It uses less power than a light bulb to keep water hot. Find it on www.shoffee.com for $99.95. There’s not much I can say about this. It leaves me speechless! I’m kidding. But really – the iPod touch is my favorite gadget EVER and I recommend that everyone buy it. NOW. And no, they didn’t send me one for free. I owe it all to my hubby’s hard earned cash. The 8 GB version is just right. It holds up to 1,750 songs, 10,000 photos, or 10 hours of video, and comes with a bunch of apps already installed. I use it for everything – to listen to music, surf the web, read email, chat on AIM, check Facebook, watch videos, play games, check the weather, and more! It’s basically like a mini computer. I wouldn’t mind if the battery lasted a little longer, as the apps and Wi-Fi drain it pretty fast. That would be my only complaint, though. The screen is beautiful, the sound quality is good, and the sheer amount of apps available (there’s an app for that!) is incredible. 8 GB retails for $199.99, but it’s on sale on Amazon for $188.95! 16GB and 32 GB also available. What I found appealing about this camera are some of its unique features – 30 shot-per-second high-speed burst shooting and high-speed night scene functions, just to name a few. All elements usually found only in big, bulky cameras! The EX-FS10 may be super thin, but it’s chock-full of options. You can set in advance the time lag between the moment that you want to capture and the actual time of taking a picture, for instance. You can also capture a still image while viewing the movement of the subject in slow motion and automatically selecting and saving one frame from continuous shots. And I can’t forget to mention the video feature! The high-speed movie function can record motion that is ordinarily too fast for the human eye to see, and then play it back in ultra-slow motion. The HD Movie function will record high quality videos at a size of 1280×720 pixels. Retails for $299. On sale for $176.95! I, too these items are a great choice for gifts & the Keurig B40 Elite Brewer would be an extra special gift for my son~ a true coffee lover!